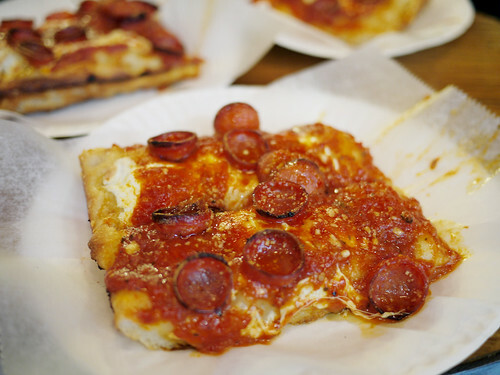 There's nothing spicy about the spicy spring square pizza at Prince St Pizza, it's a fancy name for what seems to be regular pepperoni pizza. But who cares what it's called when you can point to it in the window and when it's decidely delicious - having that crack-like quality of bad junk food that is just so good you can't stop eating. We got 3 slices to share, but that last half we could have easily done without. I especially love the chewiness of the dough followed by dense crunchy crust.